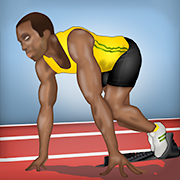 100 Meters Sprint is an online Sports game which can be played at Plonga.com for free. 100 Meters Sprint has a rating of 3 stars (out of 5) and it has been played 10441 times now. Please go to our Sports games section if you want to play more games like 100 Meters Sprint! Challenge the best runners in the world and try to beat the world record in this online 100 meters sprint race!